"Hydrogen monoxide" redirects here. For the hoax involving the chemical name of water, see Dihydrogen monoxide hoax. Solubility Poorly soluble in haloalkanes, aliphatic and aromatic hydrocarbons, ethers. Improved solubility in carboxylates, alcohols, ketones, amines. Miscible with methanol, ethanol, isopropanol, acetone, glycerol. 2O) is a polar inorganic compound that is at room temperature a tasteless and odorless liquid, nearly colorless with a hint of blue. The simplest hydrogen chalcogenide, it is by far the most studied chemical compound and is described as the "universal solvent" for its ability to dissolve many substances. This allows it to be the "solvent of life". It is the only common substance to exist as a solid, liquid, and gas in nature. Water molecules form hydrogen bonds with each other and are strongly polar. This polarity allows it to separate ions in salts and strongly bond to other polar substances such as alcohols and acids, thus dissolving them. Its hydrogen bonding causes its many unique properties, such as having a solid form less dense than its liquid form, a relatively high boiling point of 100 °C for its molar mass, and a high heat capacity. Due to water being a very good solvent, it is rarely pure and some of the properties of impure water can vary from those of the pure substance. However, there are also many compounds that are essentially, if not completely, insoluble in water, such as fats, oils and other nonpolar substances. The simplest systematic name of water is hydrogen oxide. This is analogous to related compounds such as hydrogen peroxide, hydrogen sulfide, and deuterium oxide (heavy water). In keeping with the basic rules of chemical nomenclature, water would have a systematic name of dihydrogen monoxide, but this is not among the names published by the International Union of Pure and Applied Chemistry. It is a rarely used name of water, and mostly used in various hoaxes or spoofs that call for this "lethal chemical" to be banned, such as in the dihydrogen monoxide hoax. 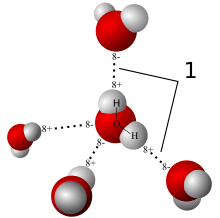 Other systematic names for water include hydroxic acid, hydroxylic acid, and hydrogen hydroxide, using acid and base names. [lower-alpha 3] None of these exotic names are used widely. 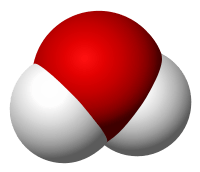 2O; one molecule of water has two hydrogen atoms covalently bonded to a single oxygen atom. Water is a tasteless, odorless liquid at ambient temperature and pressure, and appears colorless in small quantities, although it has its own intrinsic very light blue hue. 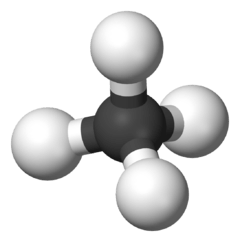 Ice also appears colorless, and water vapor is essentially invisible as a gas. Water is primarily a liquid under standard conditions, which is not predicted from its relationship to other analogous hydrides of the oxygen family in the periodic table, which are gases such as hydrogen sulfide. The elements surrounding oxygen in the periodic table, nitrogen, fluorine, phosphorus, sulfur and chlorine, all combine with hydrogen to produce gases under standard conditions. The reason that water forms a liquid is that oxygen is more electronegative than all of these elements with the exception of fluorine. Oxygen attracts electrons much more strongly than hydrogen, resulting in a net positive charge on the hydrogen atoms, and a net negative charge on the oxygen atom. These atomic charges give each water molecule a net dipole moment. Electrical attraction between water molecules due to this dipole pulls individual molecules closer together, making it more difficult to separate the molecules and therefore raising the boiling point. This attraction is known as hydrogen bonding. The molecules of water are constantly moving in relation to each other, and the hydrogen bonds are continually breaking and reforming at timescales faster than 200 femtoseconds (2×10−13 seconds). However, these bonds are strong enough to create many of the peculiar properties of water, some of which make it integral to life. Water can be described as a polar liquid that slightly dissociates disproportionately or self ionizes into an hydronium ion and hydroxide ion. 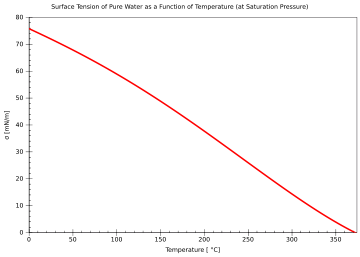 The dissociation constant for this dissociation is commonly symbolized as Kw and has a value of about 10−14 at 25 °C; see here for values at other temperatures. The fourth state of water, that of a supercritical fluid, is much less common than the other three and only rarely occurs in nature, in extremely hostile conditions. When water achieves a specific critical temperature and a specific critical pressure (647 K and 22.064 MPa), the liquid and gas phases merge to one homogeneous fluid phase, with properties of both gas and liquid. A likely example of naturally occurring supercritical water is in the hottest parts of deep water hydrothermal vents, in which water is heated to the critical temperature by volcanic plumes and the critical pressure is caused by the weight of the ocean at the extreme depths where the vents are located. This pressure is reached at a depth of about 2200 meters: much less than the mean depth of the ocean (3800 meters). Water has a very high specific heat capacity of 4.1814 J/(g·K) at 25 °C – the second highest among all the heteroatomic species (after ammonia), as well as a high heat of vaporization (40.65 kJ/mol or 2257 kJ/kg at the normal boiling point), both of which are a result of the extensive hydrogen bonding between its molecules. These two unusual properties allow water to moderate Earth's climate by buffering large fluctuations in temperature. According to Josh Willis, of NASA's Jet Propulsion Laboratory, the oceans can absorb one thousand times more heat than the atmosphere without changing their temperature much and are absorbing 80 to 90% of the heat global warming. The density of water is about 1 gram per cubic centimetre (62 lb/cu ft): this relationship was originally used to define the gram. The density varies with temperature, but not linearly: as the temperature increases, the density rises to a peak at 3.98 °C (39.16 °F) and then decreases. This unusual negative thermal expansion below 4 °C (39 °F) is also observed in molten silica. Regular, hexagonal ice is also less dense than liquid water—upon freezing, the density of water decreases by about 9%. Other substances that expand on freezing are acetic acid, silicon, gallium, germanium, bismuth, plutonium and also chemical compounds that form spacious crystal lattices with tetrahedral coordination. Under increasing pressure, ice undergoes a number of transitions to other allotropic forms with higher density than liquid water, such as ice II, ice III, high-density amorphous ice (HDA), and very-high-density amorphous ice (VHDA). The unusual density curve and lower density of ice than of water is vital to life—if water was most dense at the freezing point, then in winter the very cold water at the surface of lakes and other water bodies would sink, the lake could freeze from the bottom up, and all life in them would be killed. Furthermore, given that water is a good thermal insulator (due to its heat capacity), some frozen lakes might not completely thaw in summer. The layer of ice that floats on top insulates the water below. Water at about 4 °C (39 °F) also sinks to the bottom, thus keeping the temperature of the water at the bottom constant (see diagram). The density of salt water depends on the dissolved salt content as well as the temperature. Ice still floats in the oceans, otherwise they would freeze from the bottom up. However, the salt content of oceans lowers the freezing point by about 1.9 °C (see here for explanation) and lowers the temperature of the density maximum of water to the freezing point. This is why, in ocean water, the downward convection of colder water is not blocked by an expansion of water as it becomes colder near the freezing point. The oceans' cold water near the freezing point continues to sink. So creatures that live at the bottom of cold oceans like the Arctic Ocean generally live in water 4 °C colder than at the bottom of frozen-over fresh water lakes and rivers. Water is miscible with many liquids, for example ethanol in all proportions, forming a single homogeneous liquid. On the other hand, water and most oils are immiscible usually forming layers according to increasing density from the top. This can be predicted by comparing the polarity. Water being a relatively polar compound will tend to be miscible with liquids of high polarity such as ethanol and acetone, whereas compounds with low polarity will tend to be immiscible and poorly soluble such as with hydrocarbons. A 3-dimensional representation of the relationships between allotropes of ice amongst each other and in relation to liquid water and gaseous water. The temperature and pressure at which solid, liquid, and gaseous water coexist in equilibrium is called the triple point of water. This point is used to define the units of temperature (the kelvin, the SI unit of thermodynamic temperature and, indirectly, the degree Celsius and even the degree Fahrenheit). As a consequence, water's triple point temperature, as measured in these units, is a prescribed value rather than a measured quantity. This pressure is quite low, about 1⁄166 of the normal sea level barometric pressure of 101,325 Pa. The atmospheric surface pressure on planet Mars is 610.5 Pa, which is remarkably close to the triple point pressure. The altitude of this surface pressure was used to define zero-elevation or "sea level" on that planet. 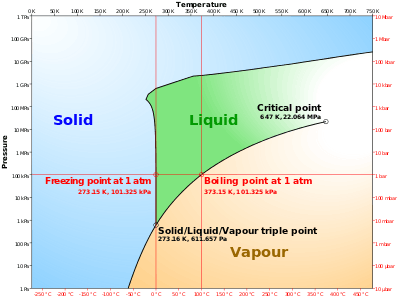 Although it is commonly named as "the triple point of water", the stable combination of liquid water, ice I, and water vapor is but one of several triple points on the phase diagram of water. Gustav Heinrich Johann Apollon Tammann in Göttingen produced data on several other triple points in the early 20th century. Kamb and others documented further triple points in the 1960s. The melting point of ice is 0 °C (32 °F; 273 K) at standard pressure; however, pure liquid water can be supercooled well below that temperature without freezing if the liquid is not mechanically disturbed. It can remain in a fluid state down to its homogeneous nucleation point of about 231 K (−42 °C; −44 °F). 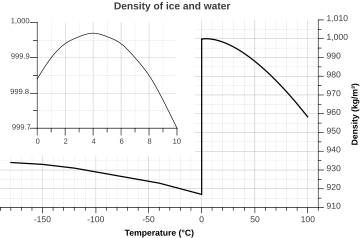 The melting point of ordinary hexagonal ice falls slightly under moderately high pressures, by 0.0073 °C (0.0131 °F)/atm[lower-alpha 6] or about 0.5 °C (0.90 °F)/70 atm[lower-alpha 7] as the stabilization energy of hydrogen bonding is exceeded by intermolecular repulsion, but as ice transforms into its allotropes (see crystalline states of ice) above 209.9 MPa (2,072 atm), the melting point increases markedly with pressure, i.e., reaching 355 K (82 °C) at 2.216 GPa (21,870 atm) (triple point of Ice VII). Because water is such a good solvent, it almost always has some solute dissolved in it, often a salt. If water has even a tiny amount of such an impurity, then it can conduct electricity far more readily. In pure water, sensitive equipment can detect a very slight electrical conductivity of 0.05501 ± 0.0001 µS/cm at 25.00 °C. Water can also be electrolyzed into oxygen and hydrogen gases but in the absence of dissolved ions this is a very slow process, as very little current is conducted. In ice, the primary charge carriers are protons (see proton conductor). Ice was previously thought to have a small but measurable conductivity of 1×10−10 S cm−1, but this conductivity is now thought to almost entirely from surface defects, and without those, ice is an insulator with an immeasurably small conductivity. Another effect of the electronic structure is that water is a polar molecule. Due to the difference in electronegativity, there is a bond dipole moment pointing from each H to the O, making the oxygen partially negative and each hydrogen partially positive. 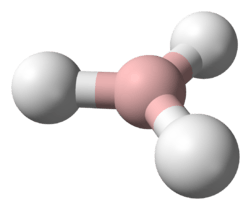 In addition, the lone pairs of electrons on the O are in the direction opposite to the hydrogen atoms. This results in a large molecular dipole, pointing from a positive region between the two hydrogen atoms to the negative region of the oxygen atom. The charge differences cause water molecules to be attracted to each other (the relatively positive areas being attracted to the relatively negative areas) and to other polar molecules. This attraction contributes to hydrogen bonding, and explains many of the properties of water, such as solvent action. However, there is an alternative theory for the structure of water. In 2004, a controversial paper from Stockholm University suggested that water molecules in liquid form typically bind not to four but to only two others; thus forming chains and rings. The term "string theory of water" (which is not to be confused with the string theory of physics) was coined. These observations were based upon X-ray absorption spectroscopy that probed the local environment of individual oxygen atoms. Water, the team suggests, is a muddle of the two proposed structures. They say that it is a soup flecked with "icebergs" each comprising 100 or so loosely connected molecules that are relatively open and hydrogen bonded. The soup is made of the string structure and the icebergs of the tetrahedral structure. 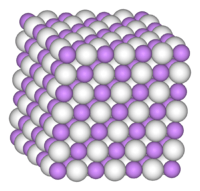 Water has a high surface tension of 71.99 mN/m at 25 °C, caused by the strong cohesion between water molecules, the highest of the common non-ionic, non-metallic liquids. This can be seen when small quantities of water are placed onto a sorption-free (non-adsorbent and non-absorbent) surface, such as polyethylene or Teflon, and the water stays together as drops. Just as significantly, air trapped in surface disturbances forms bubbles, which sometimes last long enough to transfer gas molecules to the water. Due to an interplay of the forces of adhesion and surface tension, water exhibits capillary action whereby water rises into a narrow tube against the force of gravity. Water adheres to the inside wall of the tube and surface tension tends to straighten the surface causing a surface rise and more water is pulled up through cohesion. The process continues as the water flows up the tube until there is enough water such that gravity balances the adhesive force. Surface tension and capillary action are important in biology. For example, when water is carried through xylem up stems in plants, the strong intermolecular attractions (cohesion) hold the water column together and adhesive properties maintain the water attachment to the xylem and prevent tension rupture caused by transpiration pull. Water is also a good solvent, due to its polarity. Substances that will mix well and dissolve in water (e.g. salts) are known as hydrophilic ("water-loving") substances, while those that do not mix well with water (e.g. fats and oils), are known as hydrophobic ("water-fearing") substances. The ability of a substance to dissolve in water is determined by whether or not the substance can match or better the strong attractive forces that water molecules generate between other water molecules. If a substance has properties that do not allow it to overcome these strong intermolecular forces, the molecules are "pushed out" from the water, and do not dissolve. Contrary to the common misconception, water and hydrophobic substances do not "repel", and the hydration of a hydrophobic surface is energetically, but not entropically, favorable. 2 are absorbed, and thus most rain is slightly acidic. If high amounts of nitrogen and sulfur oxides are present in the air, they too will dissolve into the cloud and rain drops, producing acid rain. Water is relatively transparent to visible light, near ultraviolet light, and far-red light, but it absorbs most ultraviolet light, infrared light, and microwaves. Most photoreceptors and photosynthetic pigments utilize the portion of the light spectrum that is transmitted well through water. Microwave ovens take advantage of water's opacity to microwave radiation to heat the water inside of foods. The very weak onset of absorption in the red end of the visible spectrum lends water its intrinsic blue hue (see Color of water). Several isotopes of both hydrogen and oxygen exist, giving rise to several known isotopologues of water. H or T), which has two neutrons. 2O. Water is typically a monodentate ligand–it forms only one bond with the central atom. Some other reactive metals, such as aluminum and beryllium, are oxidized by water as well, but their oxides adhere to the metal and form a passive protective layer. Note, however, that the rusting of iron is a reaction between iron and oxygen that is dissolved in water, not between iron and water. The gases produced bubble to the surface, where they can be collected. The standard potential of the water electrolysis cell (when heat is added to the reaction) is a minimum of 1.23 V at 25 °C. The operating potential is actually 1.48 V (or above) in practical electrolysis when heat input is negligible. 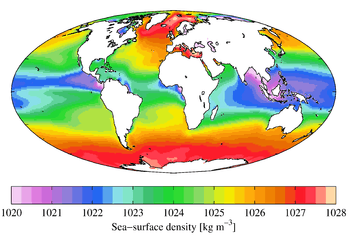 1 2 Vienna Standard Mean Ocean Water (VSMOW), used for calibration, melts at 273.1500089(10) K (0.000089(10) °C, and boils at 373.1339 K (99.9839 °C). Other isotopic compositions melt or boil at slightly different temperatures. ↑ A commonly quoted value of 15.7 used mainly in organic chemistry for the pKa of water is incorrect. 1 2 Braun, Charles L.; Smirnov, Sergei N. (1993-08-01). "Why is water blue?". Journal of Chemical Education. 70 (8): 612. Bibcode:1993JChEd..70..612B. doi:10.1021/ed070p612. ISSN 0021-9584. 1 2 3 Anatolievich, Kiper Ruslan. "Properties of substance: water". ↑ Lide, David R. (2003-06-19). CRC Handbook of Chemistry and Physics, 84th Edition. CRC Handbook. CRC Press. Vapor Pressure of Water From 0 to 370° C in Sec. 6. ISBN 9780849304842. ↑ Lide, David R. (2003-06-19). CRC Handbook of Chemistry and Physics, 84th Edition. CRC Handbook. CRC Press. Chapter 8: Dissociation Constants of Inorganic Acids and Bases. ISBN 9780849304842. ↑ Ramires, Maria L. V.; Castro, Carlos A. Nieto de; Nagasaka, Yuchi; Nagashima, Akira; Assael, Marc J.; Wakeham, William A. (1995-05-01). "Standard Reference Data for the Thermal Conductivity of Water". Journal of Physical and Chemical Reference Data. 24 (3): 1377–1381. doi:10.1063/1.555963. ISSN 0047-2689. ↑ Lide, David R. (2003-06-19). CRC Handbook of Chemistry and Physics, 84th Edition. CRC Handbook. CRC Press. 8—Concentrative Properties of Aqueous Solutions: Density, Refractive Index, Freezing Point Depression, and Viscosity. ISBN 9780849304842. ↑ Lide, David R. (2003-06-19). CRC Handbook of Chemistry and Physics, 84th Edition. CRC Handbook. CRC Press. 6.186. ISBN 9780849304842. ↑ Lide, David R. (2003-06-19). CRC Handbook of Chemistry and Physics, 84th Edition. CRC Handbook. CRC Press. 9—Dipole Moments. ISBN 9780849304842. 1 2 Leigh, G. J.; et al. (1998). Principles of chemical nomenclature: a guide to IUPAC recommendations (PDF). Blackwell Science Ltd, UK. p. 34. ISBN 0-86542-685-6. Archived (PDF) from the original on 2011-07-26. ↑ Nomenclature of Inorganic Chemistry: IUPAC Recommendations 2005 (PDF). Royal Society of Chemistry. 22 Nov 2005. p. 85. ISBN 978-0-85404-438-2. Retrieved 2016-07-31. ↑ Leigh, G. J.; et al. (1998). Principles of chemical nomenclature: a guide to IUPAC recommendations (PDF). IUPAC, Commission on Nomenclature of Organic Chemistry. Blackwell Science Ltd, UK. p. 99. ISBN 0-86542-685-6. Archived (PDF) from the original on 2011-07-26. ↑ "Tetrahydropyran". Pubchem. National Institutes of Health. Retrieved 2016-07-31. ↑ "Compound Summary for CID 22247451". Pubchem Compound Database. National Center for Biotechnology Information. ↑ Leigh, G. J.; et al. (1998). Principles of chemical nomenclature: a guide to IUPAC recommendations (PDF). Blackwell Science Ltd, UK. pp. 27–28. ISBN 0-86542-685-6. Archived (PDF) from the original on 2011-07-26. ↑ "Water (Code C65147)". NCI Thesaurus. National Cancer Institute. Retrieved 2016-08-01. ↑ Smith, Jared D.; Christopher D. Cappa; Kevin R. Wilson; Ronald C. Cohen; Phillip L. Geissler; Richard J. Saykally (2005). "Unified description of temperature-dependent hydrogen bond rearrangements in liquid water" (PDF). Proc. Natl. Acad. Sci. USA. 102 (40): 14171–14174. Bibcode:2005PNAS..10214171S. doi:10.1073/pnas.0506899102. PMC 1242322 . PMID 16179387. ↑ Deguchi, Shigeru; Tsujii, Kaoru (2007-06-19). "Supercritical water: a fascinating medium for soft matter". Soft Matter. 3 (7): 797. Bibcode:2007SMat....3..797D. doi:10.1039/b611584e. ISSN 1744-6848. ↑ NASA – Oceans of Climate Change. Nasa.gov (2009-04-22). Retrieved on 2011-11-22. ↑ Lide, David R. (2003-06-19). CRC Handbook of Chemistry and Physics, 84th Edition. CRC Handbook. CRC Press. 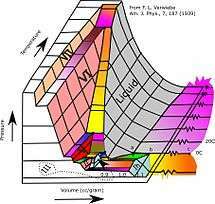 Chapter 6: Properties of Ice and Supercooled Water. ISBN 9780849304842. ↑ Lide, David R. (2003-06-19). CRC Handbook of Chemistry and Physics, 84th Edition. CRC Handbook. CRC Press. 6. 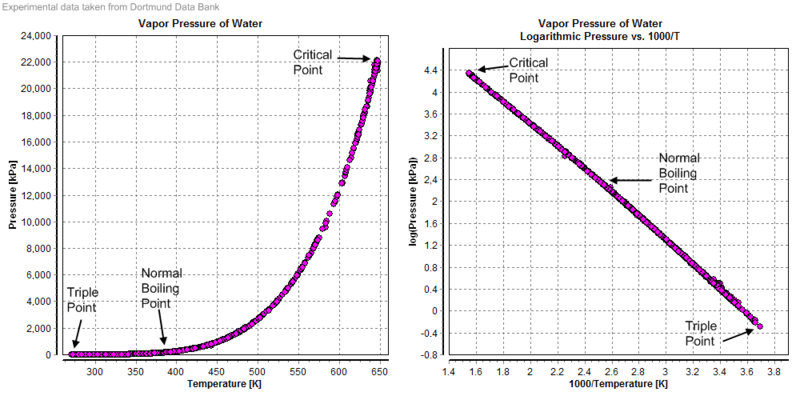 Properties of Water and Steam as a Function of Temperature and Pressure. ISBN 9780849304842. ↑ "Decree on weights and measures". April 7, 1795. 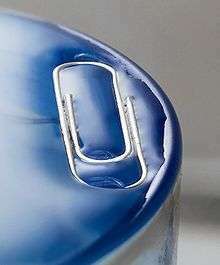 Gramme, le poids absolu d'un volume d'eau pure égal au cube de la centième partie du mètre, et à la température de la glace fondante. 1 2 3 4 Greenwood, Norman N.; Earnshaw, Alan (1997). Chemistry of the Elements (2nd ed.). Butterworth-Heinemann. p. 625. ISBN 0-08-037941-9. ↑ Shell, Scott M.; Debenedetti, Pablo G. & Panagiotopoulos, Athanassios Z. (2002). "Molecular structural order and anomalies in liquid silica" (PDF). Phys. Rev. E. 66: 011202. arXiv:cond-mat/0203383 . Bibcode:2002PhRvE..66a1202S. doi:10.1103/PhysRevE.66.011202. 1 2 3 4 5 Perlman, Howard. "Water Density". The USGS Water Science School. Retrieved 2016-06-03. ↑ Zumdahl, Steven S.; Zumdahl, Susan A. (2013-01-01). Chemistry (9th ed.). Cengage Learning. p. 938. ISBN 978-1-13-361109-7. ↑ Loerting, Thomas; Salzmann, Christoph; Kohl, Ingrid; Mayer, Erwin; Hallbrucker, Andreas (2001-01-01). "A second distinct structural "state" of high-density amorphous ice at 77 K and 1 bar". Physical Chemistry Chemical Physics. 3 (24): 5355–5357. doi:10.1039/b108676f. ISSN 1463-9084. ↑ Greenwood, Norman N.; Earnshaw, Alan (1997). Chemistry of the Elements (2nd ed.). Butterworth-Heinemann. p. 624. ISBN 0-08-037941-9. ↑ Zumdahl, Steven S.; Zumdahl, Susan A. (2013-01-01). Chemistry (9th ed.). Cengage Learning. p. 493. ISBN 978-1-13-361109-7. 1 2 3 "Can the ocean freeze?". National Ocean Service. National Oceanic and Atmospheric Administration. Retrieved 2016-06-09. 1 2 Nave, R. "Bulk Elastic Properties". HyperPhysics. Georgia State University. Retrieved 2007-10-26. ↑ Review of the vapour pressures of ice and supercooled water for atmospheric applications. D. M. Murphy and T. Koop (2005) Quarterly Journal of the Royal Meteorological Society, 131, 1539. ↑ Zeitler, W.; Ohlhof, T.; Ebner, H. (2000). "Recomputation of the global Mars control-point network" (PDF). Photogrammetric Engineering & Remote Sensing. 66 (2): 155–161. Retrieved 2009-12-26. ↑ Schlüter, Oliver (2003-07-28). "Impact of High Pressure — Low Temperature Processes on Cellular Materials Related to Foods" (PDF). Technischen Universität Berlin. ↑ Tammann, Gustav H.J.A (1925). "The States Of Aggregation". Constable And Company. ↑ Lewis, William C.M. & Rice, James (1922). A System of Physical Chemistry. Longmans, Green and Co.
↑ Debenedetti, P. G. & Stanley, H. E. (2003). "Supercooled and Glassy Water" (PDF). Physics Today. 56 (6): 40–46. Bibcode:2003PhT....56f..40D. doi:10.1063/1.1595053. ↑ Sharp, Robert Phillip (1988-11-25). Living Ice: Understanding Glaciers and Glaciation. Cambridge University Press. p. 27. ISBN 0-521-33009-2. ↑ "Revised Release on the Pressure along the Melting and Sublimation Curves of Ordinary Water Substance" (PDF). IAPWS. September 2011. Retrieved 2013-02-19. 1 2 Light, Truman S.; Licht, Stuart; Bevilacqua, Anthony C.; Morash, Kenneth R. (2005-01-01). "The Fundamental Conductivity and Resistivity of Water". Electrochemical and Solid-State Letters. 8 (1): E16–E19. doi:10.1149/1.1836121. ISSN 1099-0062. ↑ Crofts, A. (1996). "Lecture 12: Proton Conduction, Stoichiometry". University of Illinois at Urbana-Champaign. Retrieved 2009-12-06. ↑ Hoy, AR; Bunker, PR (1979). "A precise solution of the rotation bending Schrödinger equation for a triatomic molecule with application to the water molecule". Journal of Molecular Spectroscopy. 74: 1–8. Bibcode:1979JMoSp..74....1H. doi:10.1016/0022-2852(79)90019-5. ↑ Zumdahl, Steven S.; Zumdahl, Susan A. (2013-01-01). Chemistry (9th ed.). Cengage Learning. p. 393. ISBN 978-1-13-361109-7. ↑ Campbell, Mary K. & Farrell, Shawn O. (2007). Biochemistry (6th ed.). Cengage Learning. pp. 37–38. ISBN 978-0-495-39041-1. ↑ Ball, Philip (2008). "Water—an enduring mystery". Nature. 452 (7185): 291–292. Bibcode:2008Natur.452..291B. doi:10.1038/452291a. PMID 18354466. ↑ Campbell, Neil A. & Reece, Jane B. (2009). Biology (8th ed.). Pearson. p. 47. ISBN 978-0-8053-6844-4. ↑ Chiavazzo, Eliodoro; Fasano, Matteo; Asinari, Pietro; Decuzzi, Paolo (2014). "Scaling behaviour for the water transport in nanoconfined geometries". Nature Communications. 5: 4565. Bibcode:2014NatCo...5E4565C. doi:10.1038/ncomms4565. ↑ Lide, David R. (2003-06-19). CRC Handbook of Chemistry and Physics, 84th Edition. CRC Press. Water in Table Surface Tension of Common Liquids. ISBN 9780849304842. ↑ Campbell, Neil (2011). Biology. Benjamin Cummings. p. 48. ISBN 0321558235. ↑ Pugliano, N. (1992-11-01). "Vibration-Rotation-Tunneling Dynamics in Small Water Clusters". Lawrence Berkeley Lab., CA (United States): 6. doi:10.2172/6642535. ↑ Richardson, Jeremy O.; Pérez, Cristóbal; Lobsiger, Simon; Reid, Adam A.; Temelso, Berhane; Shields, George C.; Kisiel, Zbigniew; Wales, David J.; Pate, Brooks H. (2016-03-18). "Concerted hydrogen-bond breaking by quantum tunneling in the water hexamer prism". Science. 351 (6279): 1310–1313. Bibcode:2016Sci...351.1310R. doi:10.1126/science.aae0012. ISSN 0036-8075. PMID 26989250. Retrieved 2016-04-23. ↑ Kolesnikov, Alexander I. (2016-04-22). "Quantum Tunneling of Water in Beryl: A New State of the Water Molecule". Physical Review Letters. 116 (16): 167802. Bibcode:2016PhRvL.116p7802K. doi:10.1103/PhysRevLett.116.167802. PMID 27152824. Retrieved 2016-04-23. ↑ Hardy, Edme H.; Zygar, Astrid; Zeidler, Manfred D.; Holz, Manfred; Sacher, Frank D. (2001). "Isotope effect on the translational and rotational motion in liquid water and ammonia". J. Chem Phys. 114 (7): 3174–3181. Bibcode:2001JChPh.114.3174H. doi:10.1063/1.1340584. ↑ Urey, Harold C.; et al. (15 Mar 1935). "Concerning the Taste of Heavy Water". Science. 81 (2098). New York: The Science Press. p. 273. doi:10.1126/science.81.2098.273-a. ↑ "Experimenter Drinks 'Heavy Water' at $5,000 a Quart". Popular Science Monthly. 126 (4). New York: Popular Science Publishing. Apr 1935. p. 17. Retrieved 7 Jan 2011. ↑ Müller, Grover C. (June 1937). "Is 'Heavy Water' the Fountain of Youth?". Popular Science Monthly. 130 (6). New York: Popular Science Publishing. pp. 22–23. Retrieved 7 Jan 2011. ↑ Miller, Inglis J., Jr.; Mooser, Gregory (Jul 1979). "Taste Responses to Deuterium Oxide". Physiology & Behavior. 23 (1): 69–74. doi:10.1016/0031-9384(79)90124-0. ↑ "Guideline on the Use of Fundamental Physical Constants and Basic Constants of Water" (PDF). IAPWS. 2001. ↑ Zumdahl, Steven S.; Zumdahl, Susan A. (2013-01-01). Chemistry (9th ed.). Cengage Learning. p. 659. ISBN 978-1-13-361109-7. 1 2 Zumdahl, Steven S.; Zumdahl, Susan A. (2013-01-01). Chemistry (9th ed.). Cengage Learning. p. 654. ISBN 978-1-13-361109-7. ↑ Zumdahl, Steven S.; Zumdahl, Susan A. (2013-01-01). Chemistry (9th ed.). Cengage Learning. p. 984. ISBN 978-1-13-361109-7. ↑ Zumdahl, Steven S.; Zumdahl, Susan A. (2013-01-01). Chemistry (9th ed.). Cengage Learning. p. 171. ISBN 978-1-13-361109-7. ↑ "Hydrides". Chemwiki. UC Davis. Retrieved 2016-06-25. ↑ Zumdahl, Steven S.; Zumdahl, Susan A. (2013-01-01). Chemistry (9th ed.). Cengage Learning. p. 932. ISBN 978-1-13-361109-7. ↑ Zumdahl, Steven S.; Zumdahl, Susan A. (2013-01-01). Chemistry (9th ed.). Cengage Learning. p. 936. ISBN 978-1-13-361109-7. ↑ Zumdahl, Steven S.; Zumdahl, Susan A. (2013-01-01). Chemistry (9th ed.). Cengage Learning. p. 338. ISBN 978-1-13-361109-7. ↑ Zumdahl, Steven S.; Zumdahl, Susan A. (2013-01-01). Chemistry (9th ed.). Cengage Learning. p. 862. ISBN 978-1-13-361109-7. ↑ Zumdahl, Steven S.; Zumdahl, Susan A. (2013-01-01). Chemistry (9th ed.). Cengage Learning. p. 981. ISBN 978-1-13-361109-7. ↑ Charlot, G. (2007). Qualitative Inorganic Analysis. Read Books. p. 275. ISBN 1-4067-4789-0. 1 2 Greenwood, Norman N.; Earnshaw, Alan (1997). Chemistry of the Elements (2nd ed.). Butterworth-Heinemann. p. 601. ISBN 0-08-037941-9. ↑ "Enterprise and electrolysis...". Royal Society of Chemistry. August 2003. Retrieved 2016-06-24. ↑ "Joseph Louis Gay-Lussac, French chemist (1778–1850)". 1902 Encyclopedia. Footnote 122-1. Retrieved 2016-05-26. ↑ A Brief History of Temperature Measurement. Home.comcast.net. Retrieved on 2011-11-22.